REDUCE your maintenance by 20%, use 30% LESS fertilizer and water - spend 40% LESS TIME inspecting your course - SAVE $100,000 - $300,000 annually! If you'd like to learn more please continue. If you'd like to immediately reserve your spot for our FREE no risk offer then sign up here! We will fly a demo of YOUR golf course, and give you a FREE high resolution aerial photo of your clubhouse to use on marketing materials! FREE? Sounds Great, sign me up! Unmanned Aerial Vehicles (UAVs) are revolutionizing the turf industry, introducing golf course superintendents to never before seen course data and actionable analysis. Through the use of UAVs, users can identify areas of plant stress that can not be seen with the naked eye, in addition to browning or yellowing of turf. Aerial imagery also provides insight into water applications can be reduced while maintaining healthy turf, aesthetics, and improving playability. Produce current maps and 3D renderings of courses, allowing golf course superintendents to see overall course health and areas of turf stress. Utilizing easy to use tools, superintendents and maintenance crews can monitor all course features, equipment and areas of interest from sprinkler heads to turf stress. Easily track problem areas and treatment progress. Detect areas of stress and seek opportunities for water reduction. These areas are presented via Drone Elevations’ software platform and are highlighted for management review. Using Drone Elevations’ tools, problem areas can be tracked, follow up tasks can be assigned to maintenance crew members, and progress is monitored over time. OK, I've heard enough. Sign me up! Pinpoint areas of interest with unmatched precision. Track specific turf problems surch as yellowing/browning spots and potential over watered areas. Each critical area can be monitored over time to show reduction in turf browning and redistribution of water from over greened areas. Utilizing RGB photo technology (similar to infrared) you can detect areas of stress not yet visible to the human eye. Transform aerial imagery into actionable data. Using Drone Elevations, areas of stress can be tracked from flight to glight and included in reports showing progress towards turf health and aesthetic goals. Stay up-to-date on turf health and improvement progress using your desktop or mobile device. Track specific turf problems such as yellowing/browning spots and potential over watered areas. Each critical area can be monitored over time to show reduction in turf browning and redistribution of water from overly green areas. Get detailed reports analyzing turf health. ​Monitor areas by specific location in detail, and track progress towards reduction goals. Analyze turf conditions to determine how best to improve course athletics and optimize water use. Become a water conservation champion. We are a leading-edge technology company providing a comprehensive solution for UAV flight services, aerial image analysis, and task management. Enabling you to maximize turf health, aesthetics and playability, while reducing water usage and costs. OK, Now I've really heard enough. Sign me up! 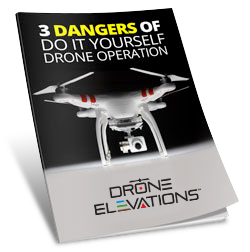 ​Click on the image above to Download this special report, "3 Dangers of Do It Yourself Drone Operation" for FREE from Drone Elevations.